We had our water tested and it has high iron, high manganese, coliform bacteria and a sulfur odor smell. Would like some information regarding the correct filtration to use. What do you recommend? This is a good application for a chlorinator, contact tank, greensand iron filter and carbon backwash filter. The chlorinator and contact tank will kill the odor and bacteria, the greensand filter will do a great job at taking out the iron and manganese, and the final stage carbon filter will remove any hint of chlorine or odor in the water and clarify it. Chlorine is a low cost and safe method of eliminating odors and bacteria, and it works great in oxidizing iron, manganese and other contaminants in water so they can be filtered out. Although there are other ways to eliminate microorganisms and odors in water, chlorination is the most commonly used because it is low cost and effective. Often combined with filtration, chlorination is an excellent and cost-effective way to disinfect drinking water supplies, eliminate odors, and oxidize iron, and other metals. 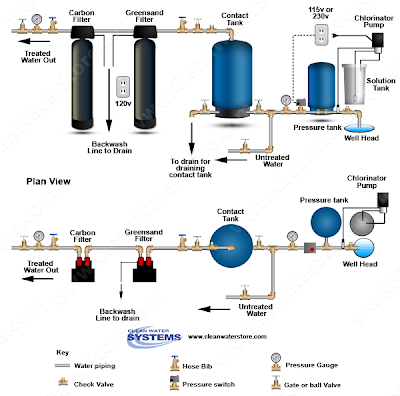 For easy and accurate chlorine injection we recommend a Stenner Pump and solution tank system. The Stenner pump uses liquid chlorine bleach. The system is reliable, easy to install, very easy to use. It can be adjusted to get just the right amount of chlorine needed for the application. The chlorinator can be adjusted so the chlorine levels are very low in the household (similar to city water) or a low cost carbon filter can be installed to remove any trace of chlorine tastes and odors. Contact provides optimal contact time after chlorine, soda ash, peroxide or other water treatment grade chemicals have been injected into the water. By using a contact tank, the amount of solution needed is less and insures that the solution being injected is thoroughly mixed and dissolved in the water. These WellMate Contact Tanks are made of a seamless inner shell of molded polyethylene and are impact and corrosion resistance. The tanks are high quality NSF/ANSI 61 certified tanks for drinking water. Inlet and outlet connections are 1-1/4” but can be reduced to 1” or ¾” if needed. One of the most heavy-duty iron filters on the market is the greensand iron filter. Greensand iron filters are very effective at removing heavy amounts of iron and manganese from well water. Greensand filters use potassium permanganate powder, which automatically cleans and restores the greensand filter media each time it backwashes. One advantage of this is that the permanganate kills any iron bacteria that can foul iron filter. If there is a strong sulfur "rotten-egg" in the well water, we recommend a chlorinator be installed in front of the greensand filter to lightly chlorinate the water first. However, if there is no sulfur odor, or if the sulfur odor is present but slight, then the greensand iron filter would work great by itself. A 1.5 cubic foot size greensand filter works great for most homes and only requires 5 gallons per minute for backwash. The greensand filter typically uses less water than other iron filters such as Mangox or air-injection iron filters. These systems are easy to install by any plumber or person familiar with basic plumbing and very easy to maintain yourself. The system is fully automatic, just add some potassium permanganate powder every few months to the solution tank, the system does the rest. If you have any sand or grit, or large sediment in the water, it helps to have a pre-filter strainer ahead of the greensand filter. Our Carbon Backwash Filter Systems remove chlorine, tastes, and odors at exceptional high flow rates with little or no pressure drop. Unlike expensive carbon filter cartridges, the Carbon Backwash Filter Systems use a bed of high grade activated to carbon to filter out chlorine, chemicals and sediment. With these systems there are no filters to change. The carbon is backwashed and rinsed clean automatically. This means no need to change short-lived filter cartridges, and no problems with pressure drop from clogged filters. The carbon media typically lasts for 3 - 5 years and is easy to dump out and change. Save hundreds of dollars over expensive filter cartridges and enjoy great flow rates with little or no maintenance required. Metering Pump & Tank: 45MHP-10 Stenner Pump with 15 gallon heavy-duty polyethylene solution tank; Pump output 0.5 to 10.0 gallons per day (1.9 to 37.9 liters per day); voltage 115 or 220V; 60 Hz. This is a complete system that comes with everything you need: solution tank; metering pump; tubing; fittings; and injection check valve. Gives contact time to allow chlorine to properly treat the water. Greensand iron filters are an excellent method of removing high levels of iron manganese and hydrogen sulfide from well waters. Iron and manganese are oxidized and precipitated instantly by contact with the greensand media. The Fleck 2510 is a heavy-duty iron filter with special brass injectors and rugged parts especially designed for greensand system. Unilke cheaper softener-to-greensand conversions, this unit is designed from the ground up to be a good long-lasting greensand filter. Excellent warranty: 5 years on the filter tank; 5 years on the control valve. Excellent for use in dechlorinating water and removing many tastes and odors. Unlike carbon cartridges which can trap sediment and dirt causing pressure drop these systems automatically backwash out trapped sediment alleviating pressure drop. Fleck 7000 control provides high flow with very little pressure drop. Excellent warranty: 10 years on the media tank; 5 years on the control valve.